This is HiJinx Toy’s Fab Figure of Buzz, the “Beat Bugs” youngest member. 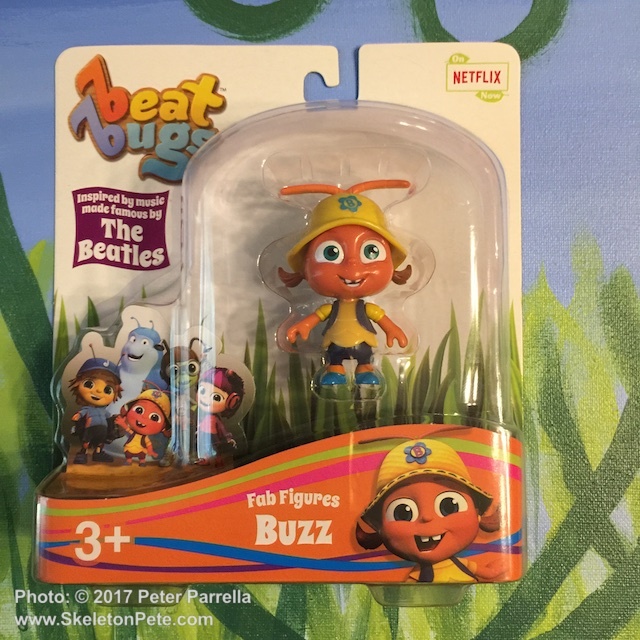 OK, I admit I’m late to the gate on this one but thanks to Toy Insider’s review merchandise from Sweet Suite 2017 (AKA “The SWAG Box”) I’m now hip to the joys of Netflix’ Beat Bugs series. After encountering a HiJinx Toys’ Fab Figure with a blister pack touting “inspired by music made famous by The Beatles” I just had to know more. 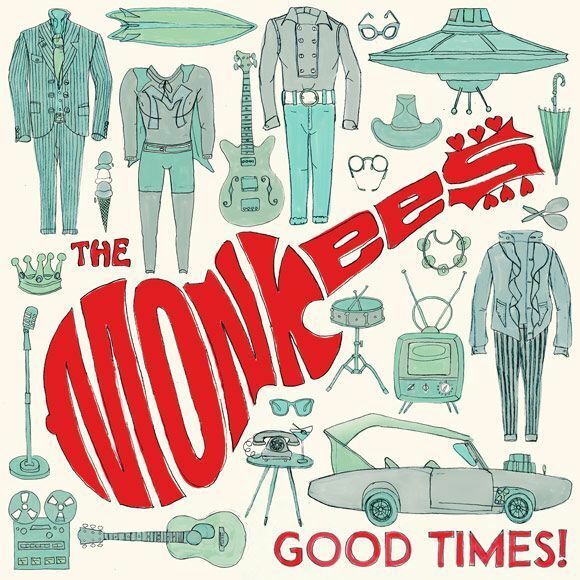 Rhino Records drops some new Monkees music on us as we wait for the release of their spruced up TV series BluRay Box Set. All 58 episodes of snarky lunacy that melded the Marx Brothers with pop culture of 1960’s West Coast America will appear in the midst of innumerable bonus features. Those extras include the group’s only feature film Head as well as the even more challenging final television special 33 1/3 Revolutions Per Monkee. The mega-set can be ordered at the Monkees’ official website only, and is limited to 10,000 copies world wide. There is a plethora of Beatles related items calling for your attention this season, from Apple’s second edition of their recordings for BBC broadcast to Kevin Howlett’s archive book on the same subject. There’s the first installment of Mark Lewisohn’s three part behemoth of Beatle-philia, and the lighthearted documentary film Good Ol’ Freda highlighting the group’s still coy and effervescent fan club president Freda Kelly. 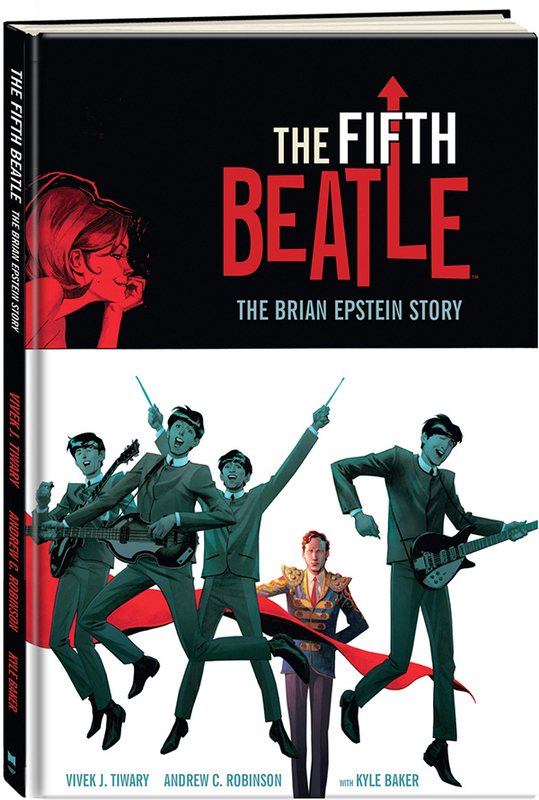 Along with these, in what might seem at first an unlikely medium, is Dark Horse’s The Fifth Beatle, a graphic novel rumination on the life of Beatles manager Brian Epstein, written by Vivek J. Tiwary and illustrated by Andrew C. Robinson with Kyle Baker. Every artist needs a true believer in their corner, and of all notable advocates Epstein stands out as a blueprint for what can be accomplished with a mix of perseverance in the face of ridiculous odds, the innate cunning of a twentieth century Medici, a paternalistic doting on his wards, with a healthy dose of personal ambition and true – though unrequited – love. Although often portrayed as a provincial who missed reaping appropriate financial rewards for many merchandizing deals, Tiwarry shows Epstein to be smart enough to lose a little in the now, to gain much more down the road. His deal with Ed Sullivan is particularly noteworthy in that sense. The Fifth Beatle is not the fluff of Epstein’s autobiography A Cellar Full of Noise but akin to the intimate – though fictionalized – character study of David Münch’s 1991 film The Hours and The Times. Behind the stoicism of Epstein’s business face is the story of a man living outside of the values of his times. Epstein’s then illegal homosexuality, his dependency on prescription drugs, family pressures and self doubt are dealt with frankly. 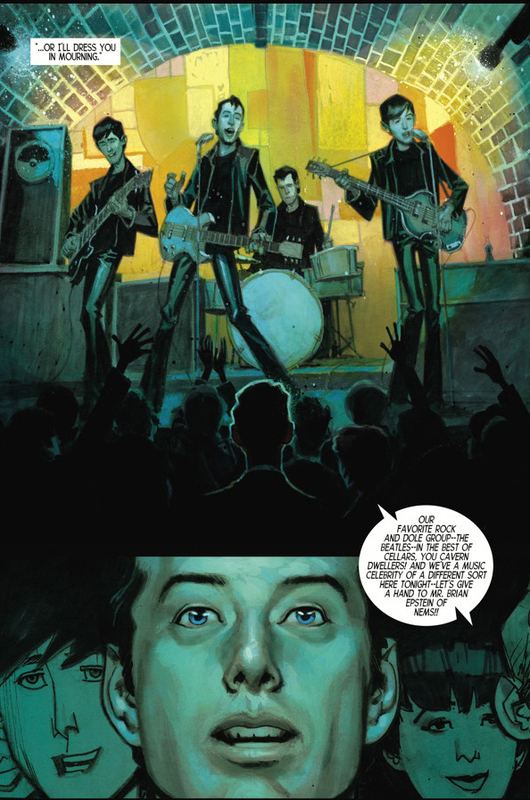 Like many great graphic novels, the pages of The Fifth Beatle could easily double as film storyboards, and indeed Dark Horse’s press release hints at a movie in the works. While his research is impeccable, Tiwary, who previously worked on Broadway’s American Idiot, The Producers and Young Frankenstein, allows himself enough creative liberty to tell the story in an artistic manner. His use of a fanciful Pepper Pots style gal Friday (a mod dollybird playfully called Moxie) creates a foil for Epstein’s inner voice, and the script’s event juxtapositions play like a Francis Coppola screenplay. It’s also quite a stage worthy scenario. Can the musical be far behind? Mid-book Kyle Baker is handed the opportunity of an artistic intermezzo to cover the 1966 debacles of the group’s Philipines tour and John Lennon’s “bigger than Christ” comment. It recounts the first chinks in the Fab’s popularity and is duly rendered in a loose comic style that suggests the madness of Alice in Wonderland’s Caucus Race and appropriately relates (in retrospect) the absurdity of it all. It’s a wry comment on what happens when fans’ unquestioning adulation turns to fanatical indignation. 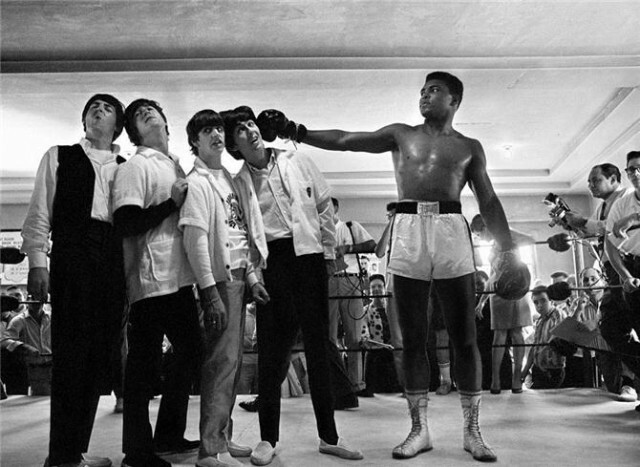 I’m pretty sure encounters with mad bull Imelda Marcos and Beatle album burnings in the American south never factored into Epstein’s most outlandish reveries of what push-backs Beatlemania might suffer. An extended “making of” section is an especially welcome addition to the already handsome hardcover. It gives readers a behind the scenes peek at the creative process with pages of Tiwarry’s script and tons of Robinson’s preliminary pencil art for major characters, blocking of pages and attention to details of the time. Don’t make the mistake of overlooking Tiwary’s meticulous research work because it is wrapped in the guise of a graphic novel. 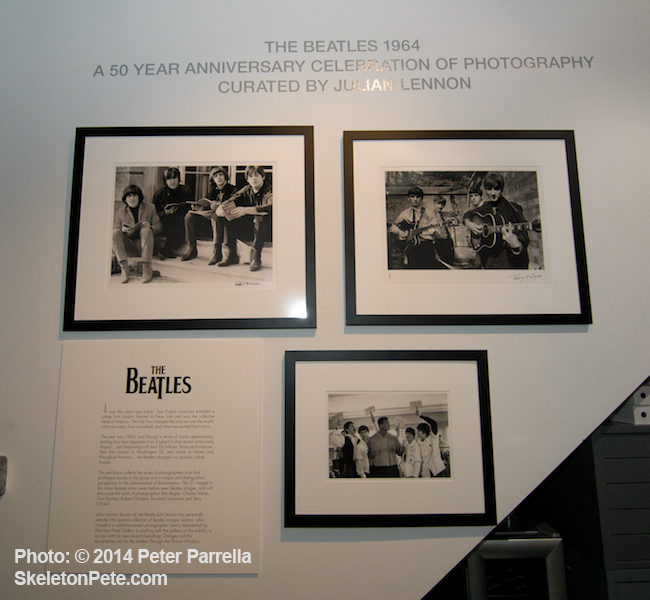 With The Fifth Beatle you get biography bathe in the beauty of Robinson and Baker’s artwork. It’s a must have addition to the bookshelves of Fabs fans and would make a delicious gift. While many weathered the heat to get gander at aquatically adorned Mermaid Parade revelers, the real Brooklyn VIP Party was going down at Bay Ridge’s Street Sounds Music Store, in the shadow of the Verrazano Bridge as we like to say. It was a special day and those in the know packed Rocky Sciano’s family run business to take in the beautiful and voluptuous curves of those American designed classics – Gretsch Guitars. You may know Gretsch instruments as the Rock-A-Billy wreckers painted up in delicious Hot Rod colors, or maybe the country picker’s choice in the hands of Chet Atkins, or maybe the hell’s bells ringing red double cutaway Jet Firebird of AC/DC’s Malcolm Young . “Who’s Next”? “Quadrophenia”? – all Pete Townshend’s 6120, gifted to him by Joe Walsh. Django – Gretsch. Eddie Cochran – Gretsch. Got the point? 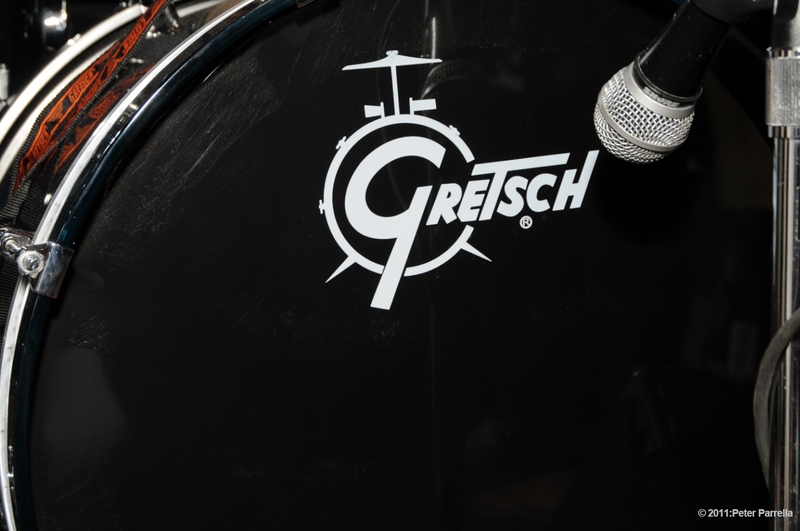 The Gretsch family company started its life in Brooklyn NYC in 1883 making banjos and drums for marching bands. They initiated their historic line of guitars in 1954. For this special event Fred Gretsch III and Product Specialist Joe Carducci paid a visit to original home turf bringing along California calendar girl Kim Falcon and top-notch picker Paul Pigat, AKA Cousin Harley. Of course the afternoon was all about the gear; the star item being the prototype of Gretsch’s 1957 Duo Jet George Harrison replica, reproduced down to the rust on the Bigsby vibrato spring. With only 60 of these puppies being produced worldwide, this Harrison family authorized gem was a thrill to ogle slowly revolving in its display case. 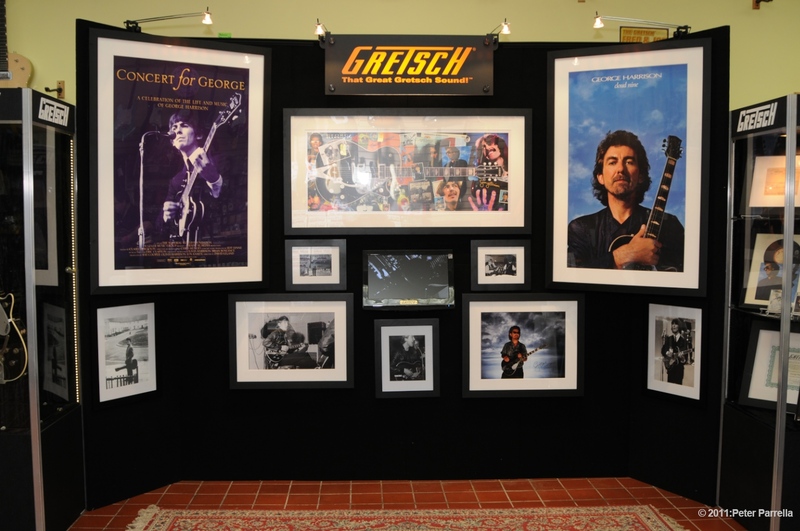 Along with the Harrison collectors item Street Sounds showed off walls hung with beautiful examples of the expansive Gretsch line and District Product Manager David Waters was on hand throughout the afternoon to offer attendees help and information on specific models. As part of the festivities, Mssrs. 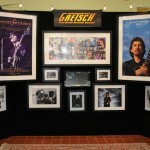 Gretsch and Carducci presented “The Fred and Joe Show” highlighting the company’s history and key artists. It was augmented to include information about the convoluted journey of George’s Duo Jet. It’s a great story, you can read it here. Raffle tickets were chosen by Ms. Falcon (with a little help from Rocky’s mom). 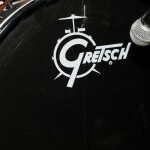 Prizes included heaps of Gretsch merch like T-shirts, playing cards, Zippo Lighters and bolo ties. 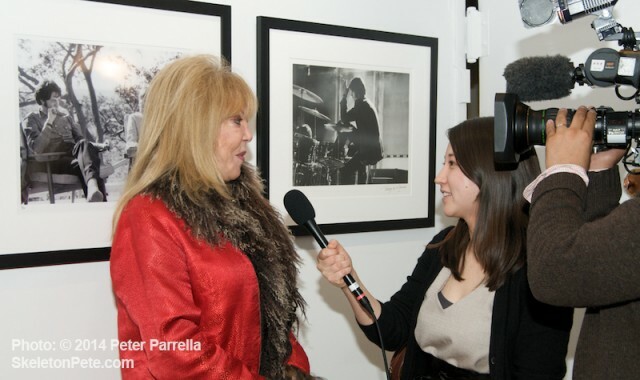 In addition, two lucky participants won killer Gretsch guitars. Paul Pigat played some smokin’ rock-a-billy, a smooth take on Hoagy Carmichael’s “Stardust”, and taught a compact lesson on the art of Travis picking. Up and coming group Foxy Studs (Joe on guitar, Christina on drums, Tammie singing and Elia on Bass) gave the audience a look at and listen to the future of Gretsch guitar and drum players. After the raffles and presentation Fred and Kim spent time meeting fans and signing autographs on calendars, posters and even a few guitars. The event was like old home week for local musicians and brought out players young and umm…seasoned from the surrounding neighborhoods. It is just so cool that so many of us have kept the faith and kept playing. There were some Prodigal Children, a Rockingham or two, John “The Cat” Gatto from – genuflect now – The Good Rats, even a couple of members of Dance Half Done. Modern Drummer editor Billy Amendola was on hand as was Piercing Metal’s main mensch Ken Pierce. The special day continued into evening with a walking tour at the original factory site – 60 Broadway in Williamsburg. Apparently, the pioneering Gretsch family beat the hipster invasion to the punch by over 100 years! The Frosted Pink Cupcake Lollipops were mind blowing! – no that’s not a psychedelic tribute band.